I know I’m not the only one who has been feeling the effects after the excesses of Christmas but I have resolved this year not to go diving straight into a “Chicken and Steamed Veg” phase that will last all of a week. I still want to eat great tasting food and I refuse to feel guilty for it! If I can make my food taste great AND be healthy well, great, but I’m not going to beat myself up about relishing one of the great pleasures in life: Good Food! With that in mind this year I hope to be sharing with you a good mix of fresh, healthy ideas and some slightly more indulgent recipes for you to enjoy! 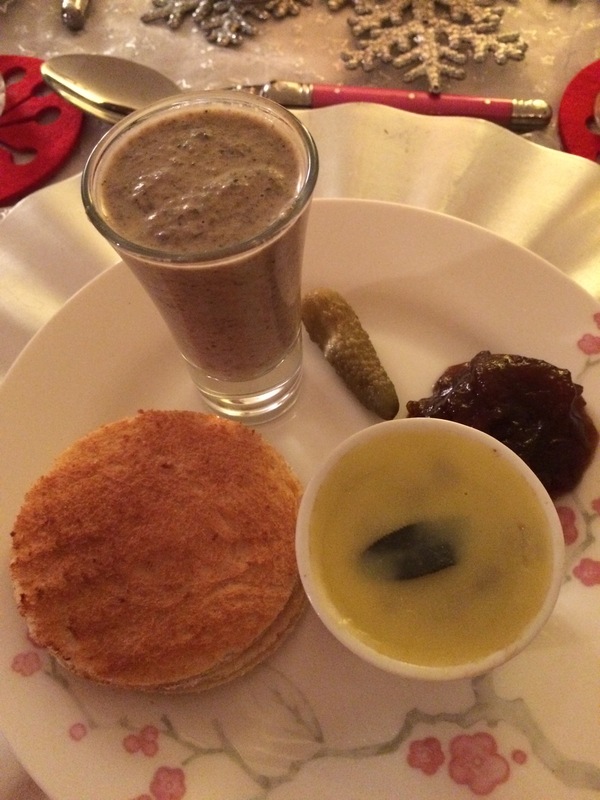 First up is this delightful Wild Mushroom Soup Recipe. Mushroom Soup always has a bit of an unfortunate aesthetic but, my goodness, does it taste good! 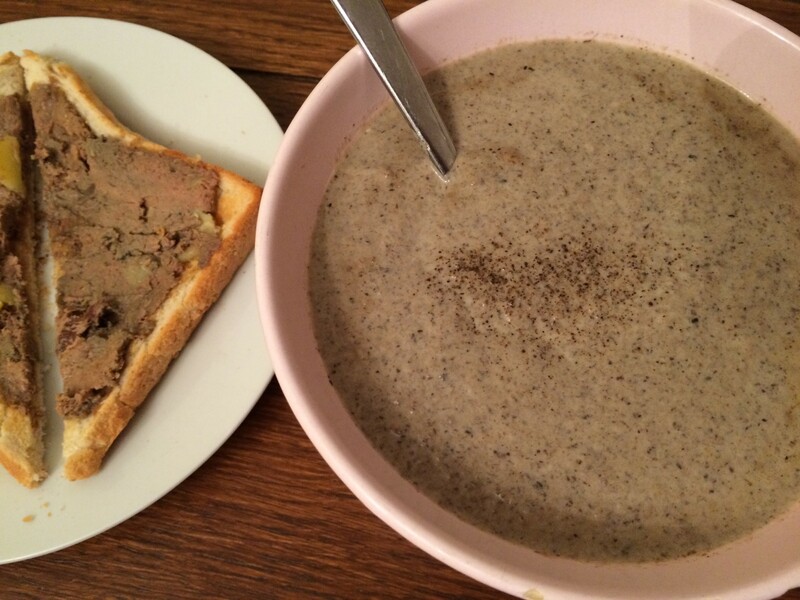 This soup is so simple to whip up and pairs brilliantly with my Bacon, Liver and Porcini Mushroom Pate as a fancy starter (soup shots are my new favourite thing!) or a light lunch. – Heat a splash of oil in a small saucepan over a medium heat. – Add the onion and gently saute until soft. – Add the mushrooms and stir about until cooked. – Add salt and pepper to taste. – Give everything a good stir and make sure the stock cube has dissolved. – Turn off the heat and put your pan on a stable heatproof surface. – Serve immediately or leave to cool completely and refrigerate until needed then reheat until piping hot on the stove or microwave. Pâté is one of my favourite foods. 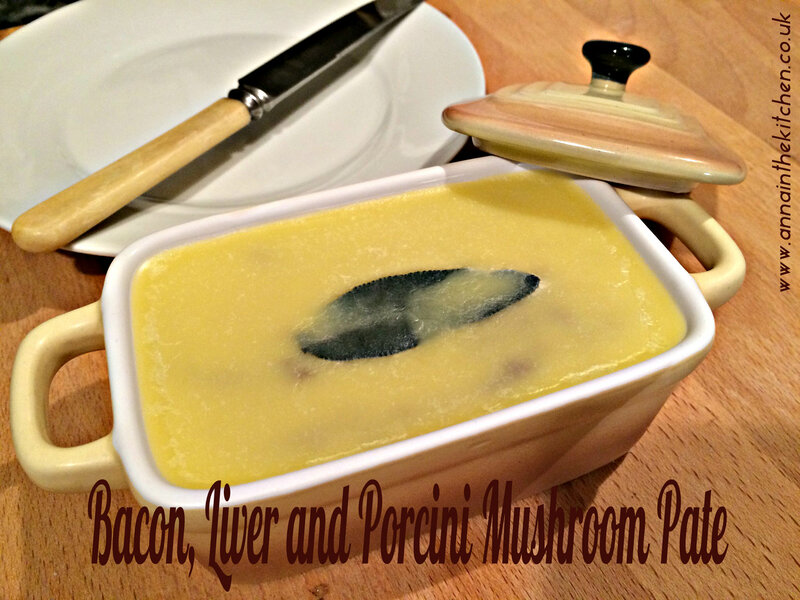 Liver Pâté is awesome, but liver is not! I love that something so gross can become something so delicious! It makes an excellent starter or a delicious light lunch, and gets some much needed iron into my diet! I have made these in preparation for Christmas entertaining and also, for personal indulgence! Making the mini ones make such an easy starter option. They can be frozen and defrosted the day before you have guests, which makes them a brilliant make ahead option. 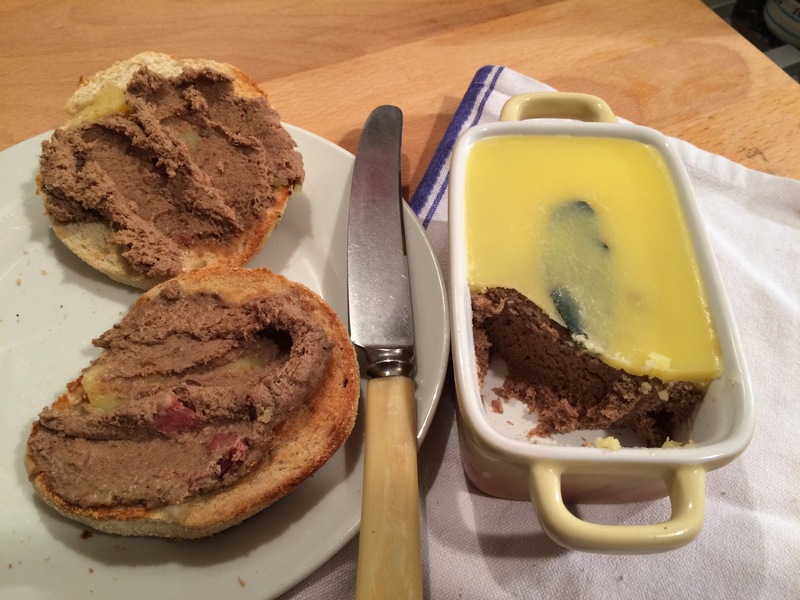 The recipe itself is so so easy, no faffy cooking and water bathing, you use the microwave to cook this, making it the quickest, easiest Pâté ever! You can make it the day before or even the morning of your event leaving you to focus on other things, like having fun! 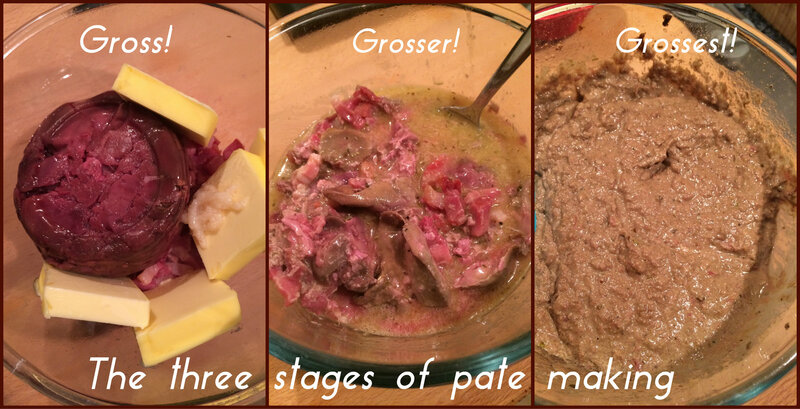 I have to admit that making pate is pretty gross… like, really gross, from a visual perspective! But you don’t need to touch anything, it’s all bunged in the microwave and out of sight for the really gross bits, but fair warning for the squeamish amongst us! – Put the dried porcini in a small bowl and just cover with boiling water. Set aside. – Put the bacon in a medium sized microwavable bowl. – Microwave on full for 1 minute. – Add the livers, the butter and the garlic. – Microwave for 2 1/2 minutes. – Drain off the mushrooms and add to the bowl, give everything a good stir. – Microwave for a further 2 1/2 minutes. – Add the cream, marsala, herbes, pepper and salt. – Using a stick blender (or decanting into a food processor) blend everything together, I like to leave it a little coarse but you can puree until utterly smooth if you prefer. – Pour into your chosen serving dishes. – Melt the salted butter and pour over the pate. 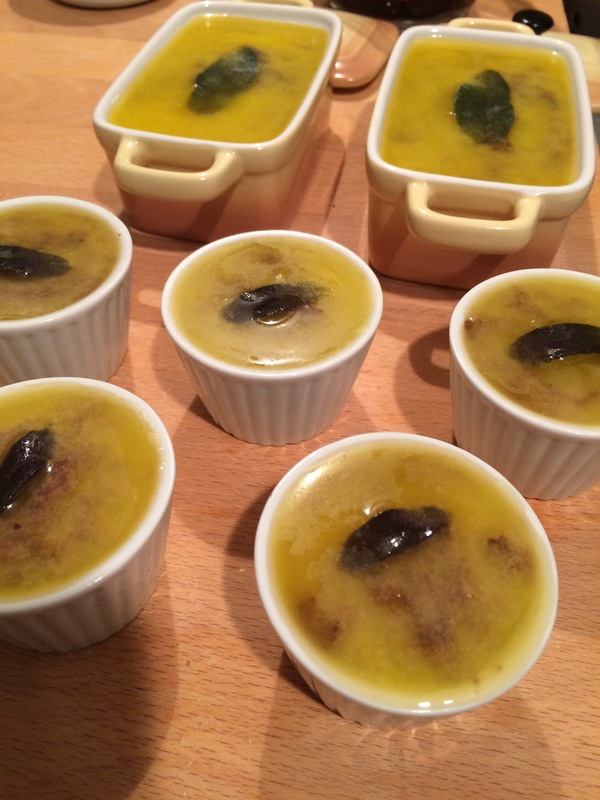 – Press a fresh sage leaf into the butter to decorate. – Leave to cool until the butter is completely set, then refrigerate until needed. You can also wrap and freeze it at this point. 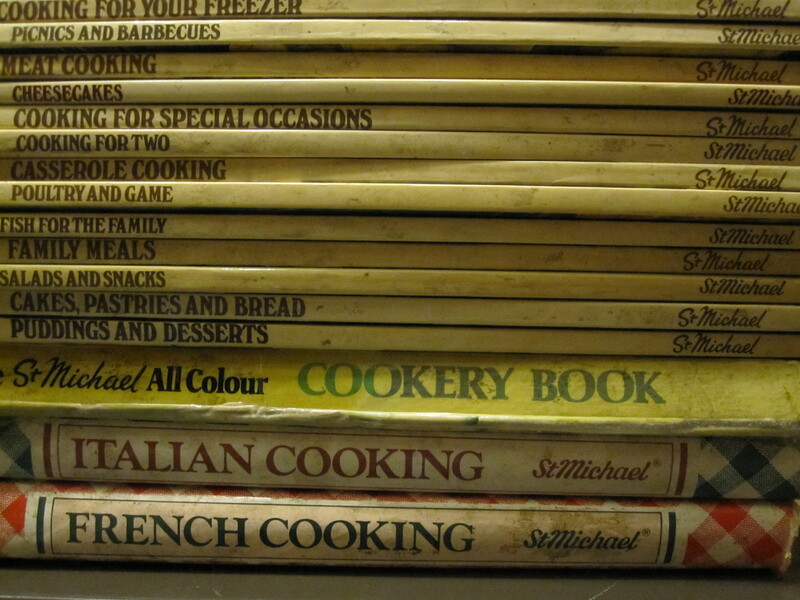 Making up a large part of my mother’s collection of, I would guess, over a hundred cook books is the St Michael range. She has almost every volume, in fact, she may actually have every volume but I’ve never asked. If you need a cook book for any type of cookery, this range will have the title just for you. They are retro in the extreme. I love just browsing through the pictures to have a giggle, one of the things I love is that there is always a photo. I never trust a cookbook I can’t see pictures in! They also happen to contain basically fool proof recipes. I’ve never met one that didn’t work. The Last Minute Christmas Cake recipe came from one, the family Chilli Con Carne recipe did too. They are basically culinary gold! Possibly the most useful one is the Microwave Cooking volume. You wouldn’t think that a book on microwave cooking witten in 1983 would be anything other than horrendous. Microwave cooking, for goodness sake! Nowadays the microwave seems to be the province of ready meals and reheating leftovers. You might, god forbid, boil your water in it (if you do I want you to go away now, I’m afraid we may not be able to remain friends after all). It doesn’t exactly speak of haute cuisine. All the things that these days are “bad” are the essence of the microwave: fast, convenient, easy, fuss free. If you’re a “real cook” cooking “good” food then you should be standing there in the kitchen, pots and pans steaming, wooden spoon in hand. Bunging your ingredients in on high for 4 1/2 minutes is, at best, cheating, surely! Not so, I say! The microwave may have a bit of a bad rep. but it can produce some culinary gold! We make a mean steamed pudding in ours and my Chicken Liver Pate is another, or this recipe for Mushrooms in Garlic Butter. Ready in 10 minutes and utterly delicious! 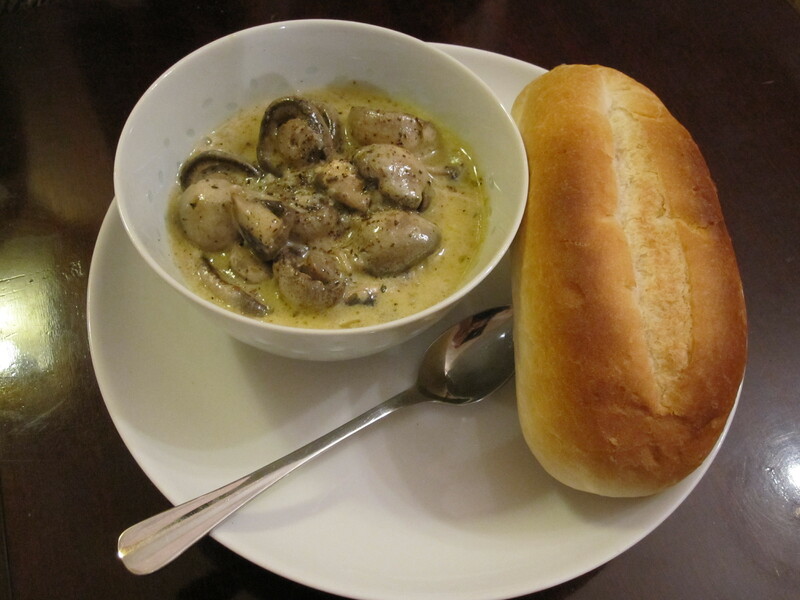 – Place the mushrooms, herbes, garlic and lemon juice in a heatproof bowl. – Cover with a plate or clingfilm and cook in the microwave on high for 6 minutes. – Uncover and drain off any excess liquid. – Cook uncovered for 2 1/2 minutes. – Take out and give a good stir. – Serve in ramekins (or rice bowls like I did here) with some nice crusty bread. These are two typical dishes I used to eat in Izakaya (Japanese pub/reastaurants) when I lived in Japan. Excellent as nibbles to wash down with decent Japanese beer! Now that I’ve mastered the mandoline I thought I’d try my hand at renkon chips. Renkon is usually translated as Lotus Root but it is actually a rhizome. Either way it tastes good and is an incredibly versatile food and it looks fantastic too! Tofu is generally thought of as a health food and even deep fried I think it’s still probably quite healthy and it tastes great with spring onions and soy sauce. In summer I wouldn’t bother deep frying it but just eat it as it is with soy sauce and spring onions but in winter it’s nicer cooked and warm! These hardly count as recipes but I thought that it was worth posting as guidance if nothing else. – Heat up the deep fat frier. – Slice the renkon finely on a mandoline and blot dry with kitchen paper. – Scatter into the basket of the deep fat frier, don’t try to do them all at once cook them in batches. – Deep fry for 2-3 minutes then tip onto kitchen paper to drain while you cook the rest. – Return them all to the deep fat frier for a further 1-2 minutes. Watch VERY CAREFULLY as it only takes a short amount of time for them to burn as mine started to do. – Again place on kitchen paper to dry then serve hot with a pinch of salt sprinkled over. – Cut the tofu into chunks and heat the deep fat frier. – Scatter the tofu into the basket and deep fry for about 3-5 minutes until golden on the outside. – Drain on kitchen paper then serve scattered with spring onions with soy sauce. Last Christmas I bought my dad some mushroom plugs so he could grow his own mushrooms (yes, he’s the hardest man on the planet to buy for) and finally this month we saw mushrooms! I think he’d abandonned the logs in his workshop so we were all a bit surprised to see massive oyster mushrooms sprouting from behind the hoover! The hunt was on to cook them in some way that would use them solely in their mushroomy goodness. We had thought of simply having them on toast but none of us are breakfast people so I upgraded that idea to mushroom bruschetta. While I was at it I also made a batch of my Tomato and Mozzerella Bruschetta. – First infuse the garlic in the oil by lightly heating in a small pan. Set aside to cool. – Slice the ciabatta into slices about 1cm thick. – Slice the garlic clove in half and rub over the sliced bread. – Brush both sides of each slice with the garlic infused oil. – On a health grill, very hot griddle or under a grill toast the bread until browned and stripey, turning once. – In the meantime heat the remaining garlic infused oil in a frying pan then add the mushrooms. – Cook until lightly browned then season to taste. – Add the creme fraiche and parsley and stir gently until it melts and coats the mushrooms. – Remove the bread from the grill and put a spoon of mushrooms on each slice. This was really the Pièce de résistance of the whole meal. It is actually quite a simple dish but looks so impressive. You could do this with any small squash that will stand up on its own (so Harlequin is out!) or you could do it with a larger kabocha as a main dish and serve it in bowls. I think that the individual squash are much more impressive though. When choosing your butternuts go for the smallest, best looking ones you can find and make sure they don’t fall over! I had to go to 3 supermarkets to find the right size so forward planning is vital. Luckily squash keep well so if you see them, snap them up! I have much-loved gratin dishes but if you’re careful you could bake them in a larger dish then transfer to bowls to serve. – Heat the oven to gas mark 2. – Prepare the squash by slicing in half and scooping out the seeds. – Place the squash in a baking dish. – Heat the cream, milk, garlic and thyme in a pan and season well. Heat through until piping hot. – Pour into the prepared squash. – Put the lids back on and pour a splash of water into the bottom of the dish to stop it sticking. – Place in the oven and bake for 1 hour 30 minutes. Turn up to Gas mark 6 for the last 15 minutes. For those wondering you eat it by scooping the flesh of the squash out into the cream. You can then eat it with chunks or somehow mush it up to be orange soup as my mum did. How she did it with a just spoon I’m unclear but she was happy! Dipping warm bread rolls in it was sublime too! An interesting variation would be to add some chopped chilli to the cream for a spicier alternative. I love dough balls from the supermarket but they’re a bit too greasy for my liking and I don’t always plan ahead and buy them. This evening mum was making spaghetti and meatballs and I suddenly fancied dough balls. I wasn’t going to drive to town and back just for dough balls so I had a look online to see what I could come up with. Unfortunately I couldn’t really find any recipes that were what I was after so I simply made it up as I went along! These aren’t exactly the same as supermarket bought ones, obviously. They’re bigger, the size of a small bread bun, and the filling escapes out into the dish but they are very tasty! I made mozerella and garlic as I love cheesy garlic bread but you could just as easily leave the cheese out or use a different cheese if you wanted to. They took me an hour from start to eating so they’re excellent for just throwing together. – Mix together the flour, salt and yeast in a bowl and make a well in the centre. – Add the oil and water to the well and mix well until it forms a soft dough, using your hands towards the end if necessary. – Turn out onto a lightly floured surface and knead for a few minutes. – Squish the dough out quite flat then add the 1 tsp oil and fold together. – Continue to knead until the dough is soft and smooth. – Cover and leave to rest while you prepare the filling. – Chop the mozerella into chunks and divide roughtly into 12 even piles. – Soften the butter (20 seconds in the microwave if straight from the fridge) and add the crushed garlic. Mix well. – Roll the dough out into a large sausage and divide into 12 equal balls. – Place the balls back in the bowl and cover while working. – Use a rolling pin to roll out each ball to about 3″ diameter. – Place a portion of mozerella in the centre then a teaspoon of garlic butter on top of that. – Gather the edges of the dough and pinch together over the filling, forming a smooth ball. – Place the ball in a greased, ovenproof dish seam down. – Repeat with each dough ball, leaving a few cm space between each ball. – Leave to rise in a warm place for 30 minutes. – Bake for 15 minutes in an oven preheated to gas mark 7. – Remove from the oven and allow to cool slightly and reabsorb the juices a bit before serving.